Archaeologists are thrilled by the discovery of 25 tablets that could reveal fascinating details of everyday life on the northern frontier of the Roman Empire. The wooden ink documents were found on June 22 at the Roman fort of Vindolanda just south of Hadrian’s Wall in Northern England. Archaeologists believe that the tablets date from between 85 and 92 A.D. The rare pieces of wood, which are about the size of modern postcards, were found preserved in damp earth about 10 feet below ground level. Tablets in conservation (The Vindolanda Trust). Masclus also features prominently in a trove of 300 tablets found at Vindolanda in 1992. In that haul, which dates from 105 A.D., Masclus made a request for beer from his commanding officer. “If you do not send me more beer, I cannot answer for the men,” he wrote. The fragile tablets, some of which are only 2mm thick, are now undergoing a painstaking three-to-four-month conservation process to ensure that they can survive in an oxygenated environment. “They are so fragile, that if we leave them in the oxygen, in the air, and they go black,” explained Birley, noting that the tablets are being carefully cleaned with deionized water. The documents are then bathed in methylated spirits and dried out. Eventually, infra-red photography will be used to fully decipher their text. “We want to try to conserve these things as long as possible so that people can go back to the primary texts and continue reading them,” Birley said. The archaeologist also noted that the current season of excavations at Vindolanda could unearth more surprises. “Our excavations have got another two-and-a-half months to go – this may not be the end of it,” he said. The Leek Frith Torcs (Staffordshire County Council). An incredible haul of ancient gold jewelry has been unearthed the U.K. by two treasure hunters using metal detectors. Detectorists Mark Hambleton and Joe Kania found the four torcs, a form of ancient necklace or bracelet, on farmland in Staffordshire in December. The finds, which were handed over to the U.K. government-funded Portable Antiquities Scheme, were announced Tuesday. Dubbed the Leek Frith Torcs, the finds may date as far back as 400 B.C. and could be the earliest examples of Iron Age gold ever discovered in Britain, experts say. The torcs, which include three neck torcs and one bracelet, are thought to be from continental Europe, possibly Germany or France. The site in the Staffordshire Moorlands area was investigated by archaeologists from Stoke-On-Trent City Council, who described the find as “complete” with no evidence of other pieces. The BBC reports that the pieces will be on display at the Potteries Museum and Art Gallery in Stoke for the next three weeks. 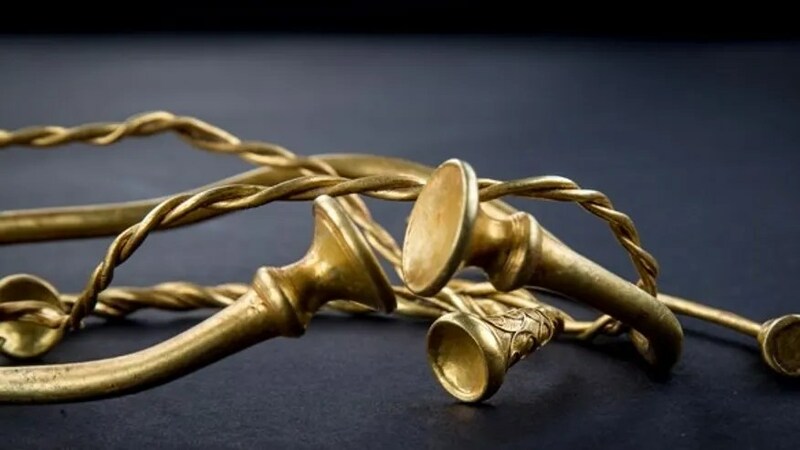 “This amazing find of gold torcs in the North of the county is quite simply magical and we look forward to sharing the secrets and story they hold in the years to come,” said Staffordshire County Council Leader Philip Atkins in the statement. An inquest Tuesday declared that the find was treasure, the BBC reports, with the artifacts deemed the property of the Crown, or British state. 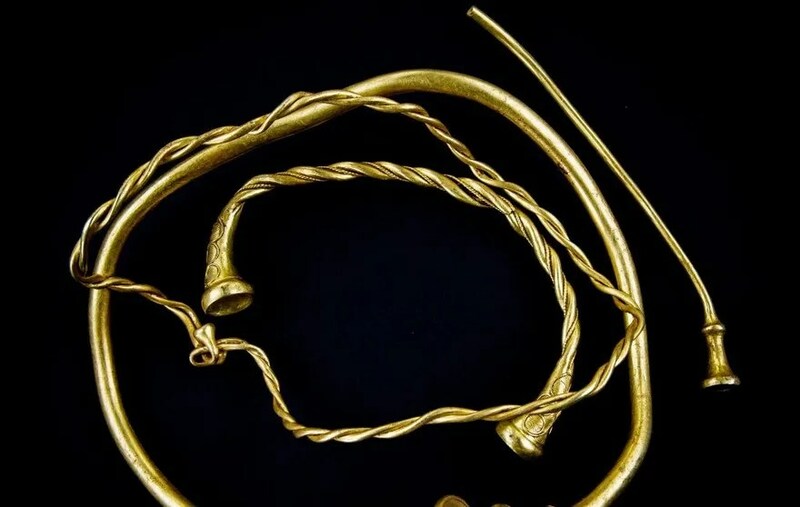 The UK Government’s Treasure Valuation Committee will offer a value to the metal detectorists that found the haul, the landowner where the discovery was made, and any museum that wants to acquire the torcs, according to the BBC. Once the parties agree on the valuation, the museum would have to raise the money to pay for the artifacts. The finders say they will share the proceeds with the landowner. This is the latest stunning ancient jewelry find in the U.K. In 2015 a huge 3,000-year-old gold belt, described as one of the largest ever discovered, was unearthed in Cambridgeshire.